HH Valves have been established as a quality supplier of valves around the World for almost 20 years with our focus & commitment to controlling all aspects of the quality procedure. Our in house hydro test rigs represent an impressive range of capabilities due to the size & pressure classes catered for & have been a key factor in successfully winning numerous projects. Our test rigs can incorporate valves up to 24� in diameter (larger depending on external dimensions), with ANSI Pressure classes from 150# - 4500# all fully tested according to API 598 and/or BS EN 12266-1. Customer specific testing available on request. 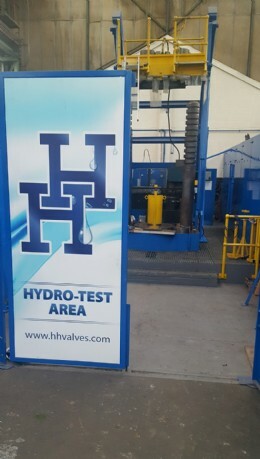 Recently HH valves have received increased enquiries for external testing to be carried out using our facilities, which we are more than happy to provide. Our factory incorporates a 10-tonne overhead crane which offers further flexibility & capabilities. As a valve manufacturer we understand that 3rd party witness inspections are often required and with our tailored test reports we can easily accommodate individual customer requirements & produce the documentation required. Should you have any testing that HH valves can assist with, please get in touch to discuss your specific needs further & we will be happy to assist.